It’s another day in Mets land, which means it’s another day of #9Innings here at the Daily Stache. Thus far, we’ve given you Adam Rubin, Alan Hahn and Kristie Ackert, but today we have another interesting one for you. Meet David Brody, the executive producer of the nationally syndicated Elvis Duran and The Morning Show (heard on Z100 in New York ) as well as being a lifelong Mets fan from Brooklyn. 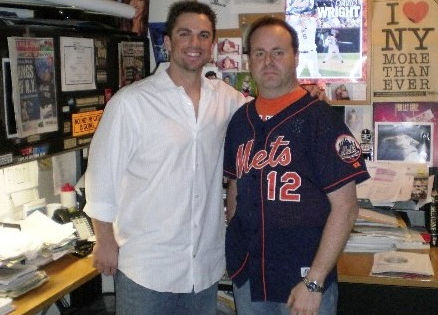 As a song parody writer for the Morning Show, Brody was able to write songs about the Mets and for the Mets when they have been good. In 2000 he wrote “Who Let The Mets Out? “ and had the Baha Men record it. It was played during the World Series. 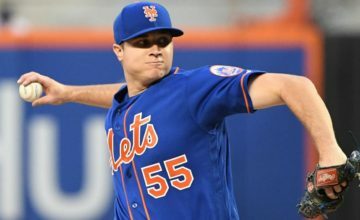 In 2006, he took Lucas Prata’s hit song “And She Said…” and made it “And We Say …Let’s Go Mets” The single was sold at Shea, and in 2007 he took Kat Deluna’s song Whine Up and had her record his Mets version “Rise Up Mets” Both songs were played at Shea Stadium. The Mets even made a video for the Prata song. 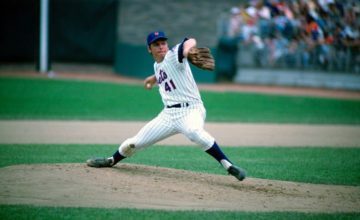 Brody can also be heard occasional on the Mets’ home radio network WOR 710 am talking about the Mets and playing some of his latest Mets songs. They still need a real home run hitter in the middle of the lineup and a better SS or outfielder if Granderson doesn’t hit. I’m still a big fan of Troy Tulowitzki if he’s healthy but not at the cost of four top prospects. Ian Desmond would also be great but I can’t imagine the Nationals trading him to the Mets in their own division. The Mets depth is starting pitching and the Nats don’t seem to need any more starters. On paper it looks like the Nats will run away with the division but injuries happen and sometimes the obvious team doesn’t win. Ex: The Dodgers. It will be interesting to see who the Mets dump and who the Mets add by the Trade Deadline if they are in it. It’s been six years since they added anyone of value at that point. 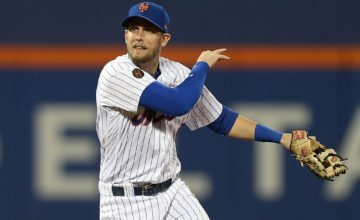 A healthy shoulder, Cuddyer and a normal right center field should all add up to a better year. Having people on base ahead of him the way Reyes used to be would also help so he sees better pitches. Wright , Granderson and D’Arnaud . Duda already has stepped up and Lagares just needs to get on base more. I hate them. Now that Jeter is gone I feel even better about hating them. It’s not a jealousy thing before that cliché comes up. I’ve hated them since the 70’s. Their fans tend to be obnoxious and their payroll is ridiculously unfair. Is in in the pathetic rules? Sure. It’s still an unfair advantage. Does their payroll guarantee anything? No but it means they can almost always compete for a title and can take bigger risks without worrying about getting stuck . It hasn’t been easy to say this for a very long time, but most experts would agree The Mets. The farm system is much better and the team has as much talent, more potential in their young players and a tremendous amount of pitching, all at 100 Million dollars less in payroll. Perhaps the biggest reason I’d pick the Mets? The Mets aren’t saddled with A-Rod for 30 Million Dollars or Sabathia or a guy like Tanaka who is a slider away from Tommy John surgery. The food I bring from home. It saves me $50 easily. Plus I don’t like leaving my seats during a game and you can’t watch the field from Center Field like you can in Philly. ….contenders, more experienced and the most exciting baseball team in New York. Hiya! I simply would like to give an enormous thumbs up for the great information you have right here on this post. I will be coming back again to your website soon. Would you open to writing a guest post? I am definitely happy to locate your site. I just wanted to thank you for the time you spent on this great article! I definitely enjoyed reading it and I have you bookmarked to check out new stuff you create.